If interested in submitting a guest post please read my guest post policy and then contact me. Investing should be part of any personal financial plan. Unfortunately, many individuals are too busy paying their monthly bills and focusing on debt reduction. They tend to leave their investments at the bottom of their financial priorities, mainly because it seems complicated to invest on their own and the lack of trust in their financial advisor. While paying down your debts is very good approach, this is not a sound reason to leave investing behind. 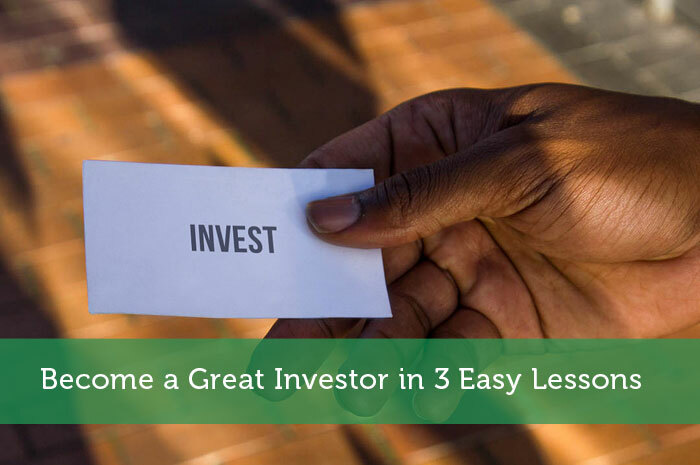 In fact, you can become a good investor if you learn these 3 easy lessons. First: Dividend Investing is Easy to Understand – A prestigious financial background is not required if you follow simple and time-tested investing principles. Second: Dividend Investing is Perfect for Lazy People – Not much time is required once you learn the basic principles and how to select your stocks. Third: Dividend Investing, when Done Right, Equals Receiving Money Each Month! – Dividend payouts are recurring. Over the past 40 years, 58% of the stock market yield was produced by dividends. Dividend stocks maintain a more stable value over time (meaning less stress for investors) while producing a constant cash flow that is more than sufficient to cover the rate of inflation. If making money is not a strong enough reason for you to consider dividend investing, then I’ll add another one: it’s passive income! Passive income has been quite the buzz word, and has even been hyped by several personal finance “gurus.” Passive income means making money while doing nothing. This is exactly what dividend investing is about: once you have worked hard to build your portfolio, money will be generated automatically. By definition, a dividend is an amount of money distributed by a company to its shareholders. This is after tax money. Meaning the company made a profit and decided to share a part of this profit with its investors. What does it tell you about a company that increases its dividend each year? You are right; it means the company is able to increase its profit year after year. It doesn’t mean a company can’t have a bad year or won’t go bankrupt because it pays dividends, but it assures you the company feels strong enough about its future to share the wealth today. This is usually a good indicator to invest. This assures me that the company is in good shape as both sales and profit must go up over the past few years. As an investor, I’m looking for companies making more money each year so they can increase their dividend on a consistent basis. Once you have found companies in this situation (and there are many), you can start a deeper analysis. The second step consists of reading about the company itself. Here again, I use a simple rule expressed by Warren Buffett, the most prolific investor alive: “Your goal as an investor should simply be to purchase, at a rational price, a part interest in an easily-understandable business whose earnings are virtually certain to be materially higher five, ten and twenty years from now.” The keyword here is “easily-understandable”. If you understand how a business makes money, you are in a better position to see its future. If you are running after the next biotech’s amazing discovery, you might be running for a long while. Once you get your set of investing rules, you should always stick to them. At first, it will seem difficult and boring to only pick sound companies with no spectacular stories, but it will lead to spectacular investment returns. Why do you invest? Most of us invest for retirement. I also have an account for my children’s education. I obviously take less risk to pay for my kids’ school than I take for my retirement as I will stop working 30 years from now. It’s important to focus on your investing goal and forget about the news. Are you worried because the market will crash and Time calls for the end of capitalism? Who cares if you retire in 5, 10 or 20 years from now? And even if you are retired, picture this: you will most likely live to 85 if not 90 years of age. Therefore, a “young” retired person at 65 still has 10 to 25 years to go with his investments. Keeping your goals in mind will prevent you from selling your stocks when they are low and buying when they are high. In fact, you will simply keep buying more shares year after year and build a comfortable nest egg for retirement. Instead of putting all your money on your debt, try putting half in your retirement account and the other half on your debts. This way, you will impact both sides of your balance sheet (increasing assets and decreasing liabilities). Don’t Know Where to Start Investing? I continuously add more features to Dividend Stocks Rock. Strong from my first 10 portfolios (8 of 10 beating the market), I’ve created the 500K+ portfolio. I’m currently working on adding ETF lists to help you with a broader range of investment solutions. You can even try the service for 30 days and cancel without any fees, how about that? Nice primer on dividend investing Mike. While I’m not typically on the hunt for dividend paying stocks per se, I have picked up a few that have worked out really well. In 2011, I picked up some Cracker Barrel (CBRL) for around an average of $43 a share. At the time it was paying about $1 a year in dividends (2.3%). While I didn’t buy it for the dividend it is now paying $1 a quarter. So $4 a year on my original investment of $43. Now I’m getting 9.3% a year passive income on my investment from 3 years ago, oh yea, and a 3x in equity. I have plenty others that didn’t work out as nicely, but when they do workout like this the dividend strategy is def. awesome! For me, a lazy-investor, I go averaging for all my stock investments. My husband and I buy only stocks that pay a dividend. In fact, we didn’t own Apple for years until it finally started paying out a dividend. We’ve held many of our stocks for a really long time. During the 07/08 financial meltdown, we just sat tight, held on to everything and the dividend payments just kept right own coming. Sweet! Dividend investing is a good way to get started. For many younger folks, they will want to eventually take on additional risk by incorporating growth stocks into their portfolio. It’s another learning method about these 3 easy lessons to become a great investor. This is very helpful and useful. I learned and many great insights here. Thanks for sharing the article. Great post! You just summarized the so many detailed information on the to-do-lists of a great investor. I like the last lesson that pursuing our goals is what defines us to be either we succeed or we fail. It’s really on our hands. Keep that big picture on.